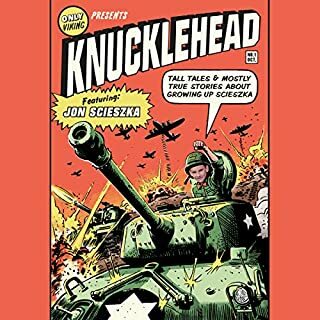 How did Jon Scieszka get so funny, anyway? Growing up as one of six brothers was a good start, but that was just the beginning. Throw in Catholic school, lots of comic books, lazy summers at the lake with time to kill, babysitting misadventures, TV shows, jokes told at family dinner, and the result is Knucklehead. Part memoir, part scrapbook, this hilarious trip down memory lane provides a unique glimpse into the formation of a creative mind and a free spirit. This is an amazing book. I always thought I would never use an audible book ,but it is soo much better than reading. You get to lie down and you don’t always have to be in a bright room. I can lay down and listen it is so nice.